If you find my web site helpful and would like to make a donation please click the PayPal link below. Money will go to making this web site even better. Only have a valet key, remote key doesn't work or looks like hell? Car doesn't respond to any of the buttons on the key fob? Key turns freely in the lock and doesn't lock or unlock anything? Are your BMW door locks not working correctly? Having trouble getting the doors unlocked? Have you had to ask passengers to climb in through the driver's side or through a window? If you answered Yes to any of these questions I might be able to help you with my GM3 or GM5 repair service. 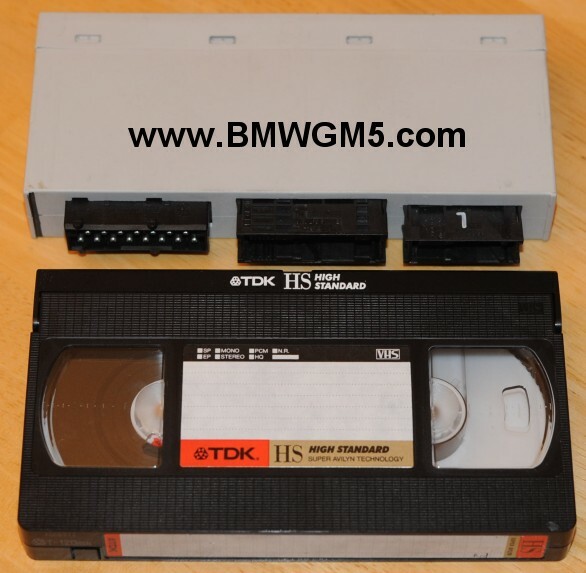 First of all this web site is mostly about the BMW General Module 3 and General Module 5, aka GM3, GM5, ZKE3 or ZKE5. In german ZKE stands for Zentral Körper Elektronik. 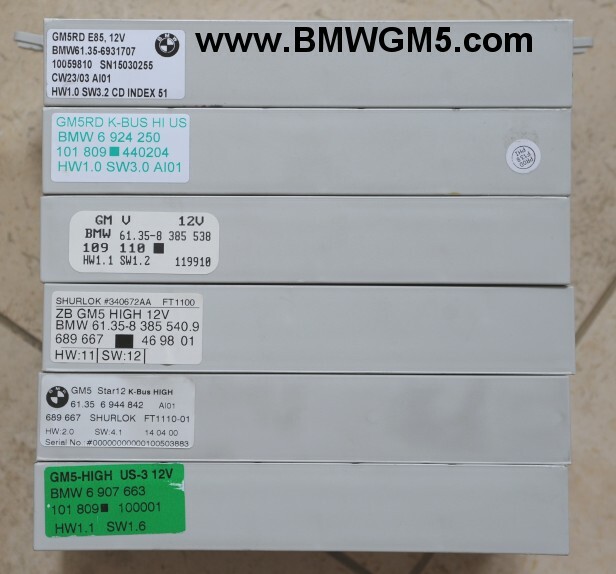 The GM3 and GM5 modules are used by BMW in a number of different vehicles built in the 1995-2008 time frame. For any of these vehicles keep reading this page. If you have an E90, E91, E92 or E93 3-series (2005-2011) then you don't have a GM5 module in your car. Please don't contact me regarding problems with this car, I cannot help you. I am aware of a big problem with the E90 (sedan) and E91 (wagon/touring) 3-series from beginning of production up to 11/2008 that have a completely different problem. More information can be found in the BMW Service Information Bulletin SI B51 19 07. Read this web page http://blog.schemingsolutions.com/?p=89 Again, please don't contact me regarding this issue. I can not help you. The article link doesn't mention it, but, try replacing fuse 56 too. By the way, this is also the list of things that won't work when the GM5 module is removed. The car will run and drive just fine except for the items listed below. Ok, that's great, but, what's the deal with my door locks? Most problems are either the door lock actuator assembly or the GM5 module. Sometimes the problem is hard to determine. For some reason, GM5 problems occur with unlocking much, much, more often than locking. Here are a few tell tale signs for determining which is the faulty part. Ok, so if it's a GM5 problem what can I do about it? 1) You can go to the dealer and get a new one installed and programmed for around $750 for parts and labor. You could save some money by buying the part, for $400 installing it yourself, but, you will still need to visit the dealer to have it programmed since the new modules come unprogrammed. 2) You can send the module to me for repair. I charge as little as $100 including Priority mail return shipping, more if you want it shipped back faster. For more information check out my Repair Service web page. 4) Complain to the National Highway Traffic Safety Act, www.nhtsa.org safety complaint online form. This won't get the problem fixed, but, at least you can be added to the growing list people with this problem and if enough people file a complaint NHTSA may require BMW to acknowledge the problem and come out with a fix, but, don't hold your breath. It may take years for anything to be done and mostly likely nothing will be done. I offer a mail in repair service as well as a drive up repair service, where I remove the module from your car, repair it and put everything back together. You don't have to touch a screwdriver or get your hands dirty. For all repair services please go to my Repair Service page. In my particular car, the doors would lock fine, but, would not unlock every time. On hot days it usually didn't work and on cooler days it would work most of the time. I decided to crack open my General Module 5 or GM5 for short which I found behind the glove box. In my car the part number is 61.35-8 385 538. I've come across at least 14 different part numbers for the GM5 module. I have a list here, GM5 part numbers. Here are 6 different GM5 modules. Some are labeled GM V, GM5RD, GM5-HIGH or just GM5. They are all basically the same. I have not see a higher occurrence of the problem on any particular P/N. In the 3-series the GM5 module is located behind the glove box in a white plastic module holder. I have detailed instructions on how to remove the module from the 3-series here -> GM5 Removal web page. What doesn't work when the General Module is out of the car? While the GM5 is out of your car several things won't work. Windshield wipers won't work (this could be a big problem if it rains! ), interior lights won't work, windows won't go up or down, no alarm functions and of course no automatic door lock control (doors can manually be locked and unlocked as long as the double lock is open.) The car is still perfectly drivable without the module, as long as it doesn't rain. If you think it's going to rain I would suggest waiting or applying some Rain-X. This stuff is amazing and I have driven many miles in the heavy rain without using my wipers at all. It causes the rain to bead up and practically fly off your windshield, it's really amazing. It must be applied when your windshield is totally dry. If it's wet it won't work very well. I've had cars come in that had bad door lock actuators, some that have bad GM5 modules and a few that have had both! There is no good way to determine if the actuator is bad except to replace it and see. On the GM5 module however the microprocessor checks itself and will log faults with the door lock outputs. The dealer can read these fault codes and determine for certain if the GM5 has a problem with the door lock outputs. If the problem persists after repair/replacement then it is an actuator problem. If it's only one door then it could be an actuator or the GM5. I checked the schematic and it's possible for the GM5 to give you problems with just the driver door or all the doors expect the drivers or all the doors. If your problem is 1 or 2 out of three passenger doors then it's not the GM5. If you pay for Express Mail return shipping I try my best to ship the modules back the same day I receive it. So, if you ship it to me next day air I will do the repair within hours of receiving it and get it to the post office before the 4pm Express Mail deadline. In most cases you will receive the module back the next day. In some cases Express Mail takes 2 days. If you pay for Priority Mail return shipping, I will repair it and ship it back within 24 hours. All repairs will be done at an antistatic workstation by a competent tech. Got a comment? Want your GM5 module repaired? Send me an email or give me a call. My email address is scottcjohnson@gmail.com and my phone number is 310-283-4273 (DO NOT text me), if I don't answer then send me an email. I'm in the Los Angeles area so please don't call too early. Tell me what car you have: model year (1999, 2000, 2001, etc. ), model (323, 325, 328, etc. ), body style (sedan, wagon, coupe or convertible). I don't care about the transmission, how many miles the car has or the VIN. Then briefly describe the problems you are experiencing (example: driver's door never unlocks with the remote, but, will with the key in the door, passenger doors sometimes do not unlock with the remote or with the key in the driver's door lock or via the central locking button, problem is worse when the interior of the car is hot or cold.) You don't need to tell me about things that work. I don't care if the wipers, windows and trunk release work just fine. Just tell me what doesn't work. Have questions? Check out my Frequently Asked Questions page. 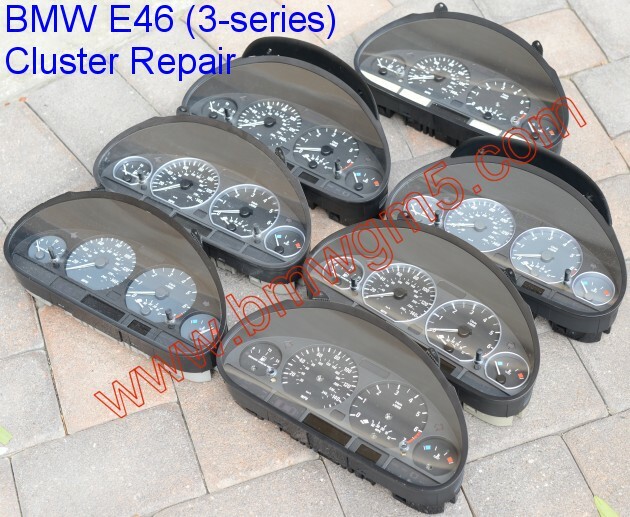 Below are a bunch of forum threads discussing the E46 door lock problem. E46Fanatics.com - "door locks are crazy" The mother of all E46 door lock threads at over 10 years and 17 pages. E46Fanatics.com - "Door lock problems"
E46Fanatics.com - "remote won't unlock passenger door"
Roadfly.com - "Door lock problem"
BMWLand.co.uk - "Arrrrrgggggghhhhhh !! central lock-out"
BMWLand.co.uk - "central locking issue"
BMWClubMalaysia - "Central Locking kaput.."